Captain Quenterindy Quirk and his company of seafaring explorers are the strangest adventurers you've ever seen! This furry and feathered crew embarks on a dangerous quest to chart the unexplored islands of Crutonia, but their expedition is cut short when their ship is attacked by three hungry giants. The explorers take refuge on an uncharted island, but the giants may be the least of their problems. The island is home to a powerful witch - the strange, one-eyed Hukka - and it's not clear if she is friend or foe. 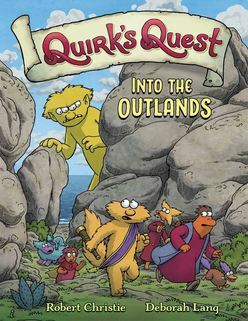 Captain Quirk and his furry explorers traverse the uncharted waters of Crutonia in this fantasy adventure story for elementary readers, from two debut authors.